Gangotri, the origin of the sacred river Ganges, is situated at an altitude of 3048 meters. Legend is King Bhagirath was rewarded by Lord Shiva after his penance to make Ganga come down to earth. It was considered that Goddess Uma or Parvati, Shiva’s consort, baths in the Ganges daily and only then she descend on the earth. 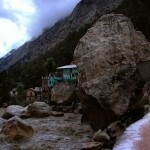 The sacred stone near the temple denotes the place where Ganga first came down to earth. Attempts to explain the mysteries of the supernatural world are ubiquitous sights here. The place lies down in the magnificent Garhwal hills. The mythological truth and the scenic beauty of the place attracts a large number of tourists every year. The summer is relatively cool and winter is freezing cold. Bhairon Valley: Bhairon Valley is located at a distance of about 8 km from Gangotri, confluence of the rivers Bhagirathi and Jat Ganga. It is famous for its temple dedicated to Bhairavnath. Jalamagna Shivling: It is a natural rock ‘Shivling’ . The Shivling is called the Jalamagna(water submerged) Shivling. This is the place where Lord Shiva caught river Ganga in his locks(as per legend). visible only during winters. 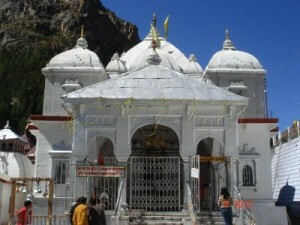 Shrine of Gangotri: The shrine is around three centuries old and was renovated in the 20th century. It is a 20-feet high structure of white granite. During the winters the idol is taken away to Mukhimath village for six months, where it is worshipped. 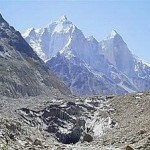 Gaumukh : Situated 18 km from Gangotri. 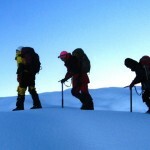 The famous Gaumukh glacier is located at an altitude of 4200 meters. It is the geographical origin of the Ganges. Here Ganges is renamed as Bhagirathi. The glacier looks like a cow’s mouth, so it is called Gaumukh. Uttarkashi: Uttarkashi is a pilgrimage spot, located at a distance of about 96 km from Gangotri. It is famous for its Vishwanath and Kuteti Devi temples. Gangnani: Gangnani is located at an altitude of about 1850 meters above sea level. The place is famous for its hot water springs. Dist: At a distance of 53 km from Gangotri. This entry was posted in Gangotri, Uttaranchal and tagged Bhairon Valley, Gangnani, gangotri dham, gangotri gaumukh, gangotri gomukh, gangotri india, gangotri photos, gangotri temple, gangotri to gaumukh, gangotri tours, gangotri trek, gangotri trekkin, gangotri yatra, Gaumukh, Jalamagna Shivling, Shrine of Gangotri, Uttarkashi. Bookmark the permalink.